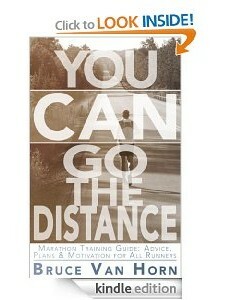 Not JUST a Marathon Training Book - You CAN Go the Distance! I know there are a lot of books already written about Marathon training. I’ve read many of them and some of them are very comprehensive, and some are written by world-class runners and well-known coaches. So what in the world could Bruce Van Horn have to say about Marathon training that hasn’t already been said or that would add value to you, the reader? I thought the very same thing! However, through the persistence of several friends, many of my blog readers, and Twitter and Facebook followers who encouraged me to write this book, I started to rethink the idea. I realized that what I have to say on the subject is a bit different than the other books on the market. My story, my experiences, and the way I’ve been able to use those experiences to encourage and motivate others to reach their goals are ways for me to add value. That is my only motivation: To add value to your life and be a source of encouragement to give you the confidence to reach your goals! What I want to share with you is not so much about training your body—though that is important and I cover a lot of that in this book. The most import part of marathon training, however, is training your mind! It is about removing the word “can’t” from your vocabulary. If you are already a marathon runner, I think there is still value here for you, as well. Many of the workouts and tips I share with you are not just for beginners, but can be used to help intermediate runners improve their performance. I know because I said those exact words to my older brother, who was a marathon runner, when he told me I should try it. I thought he was crazy… but I was wrong! Most people never run a marathon, or quit trying a few weeks into their training, because they convince themselves they can’t do it. What I learned about myself, and what I am going to help you learn about yourself, is that you CAN go the distance! My brother’s words echoed in my head for a few weeks. I was overweight, out of shape, and had not run since high school. I decided the least I could do is start exercising and do some light jogging. It took me over a month to get to the point I could jog one mile without walking. But reaching that milestone gave me a boost of confidence. One mile became two, and two became three and, less than a year later, I completed my first marathon! I struggled with fear and self-doubt for a long time. Fortunately, someone pushed me out of my comfort zone and encouraged me to at least try. Once I decided to at least try, the fear and doubt gradually faded away. So, while this IS a book about marathon training, it’s not JUST a book about marathon training! In this book, I am going to help you learn how to change the way you think about your goals and the challenges you will face in life. I will give you the confidence to believe in yourself and help you find the courage to conquer fear and take the first steps toward achieving those goals and doing the things you never thought you could do. I do not want to just be your coach. I will be your cheerleader, your biggest fan, and the friend who is going to push you—when you need a little push—to get out of your comfort zone and on your way to being a marathon runner! So I will tell you again; you CAN go the distance! Awesome, Bill. Great catches. I’ve made those changes! Love your introduction especially how you emphasise the importance of training the mind. The way you set this up, Imam right there with you – I have experienced the mind battle so already am looking forward to what comes next which too me is the key ingredient – what keeps the reader wanting to move to the next chapter. Stephan, thank you for your comment! So glad you’re winning the battle! I really like the idea of being able to comment after each chapter. Glad I bought the book. Thanks. I’m glad you came here to comment! Let me know what you think as you read through the book! Good luck with your training! I will. Thanks a lot! What a neat idea, encouraging readers to comment chapter by chapter, Bruce! Also, I like how you’ve presented this as more than a book about running. Some of the best lessons in life come that way: wrapped in sage advice on a related subject.